The hiking and biking trail running alongside the restored railroad depot in Elmore, Ohio is part of a much larger network of trails running through the Buckeye State. We spotted several walkers and bicyclists along the trail as we stopped at Elmore's Walter Ory Park to check out the depot and a restored log cabin. We crossed and re-crossed the trail as we drove through the area to do some research for an assignment and do a little geocaching, which had me wishing I'd had my bicycle with me and had time that day to explore the trail some more. The portion of the trail running through Elmore continues on through northern Ohio farmland through the towns of Clyde, Fremont, Lindsey and Bellevue. The route runs within a half-mile of the Rutherford B. Hayes Presidential Center and Library at Fremont and within a block of downtown Elmore with its bike shop, eateries and stores. This 28-mile stretch is part of the developing 65-mile North Coast Inland Trail. The Elmore-to-Bellevue section is a mostly paved rail-to-trail route using the roadbed of the vacated rail line and a few miles of a marked route on city streets through Fremont. The trail, open year round, draws walkers, runners and inline skaters. It is not open to motorized vehicles, with the exception of wheelchairs or other handicap assistance vehicles. They do plow this section of the trail when it snows, so it unfortunately isn't really a cross-country skiing route. The trail is open from 8 a.m. until dark and there are multiple access points along the way. Check out this online map for the Elmore to Bellevue portion of the trail which shows the locations of parking, restrooms, drinking water, picnic areas and other trail amenities. The 10.5-mle section of the trail from Fremont to Elmore opened to the public on October 12, 2008. 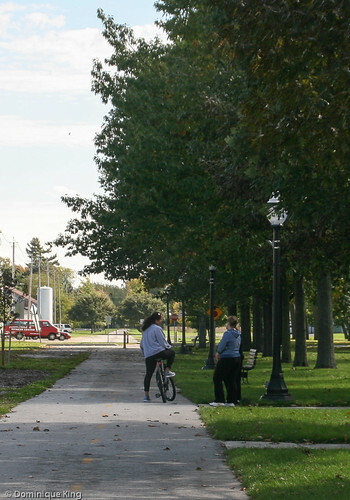 Planning for this section of the trail hit high gear in 2005 when Ohio's Department of Natural Resources reported that the Sandusky County Park District received a $375,000 grant toward engineering and constructing the trail from Fremont to Elmore. Development of the North Coast Inland trail continues in sections with the latest completed 5-mile stretch between Clyde and Bellevue opening to the public on October 11, 2012. The North Coast Inland trail is one of two ambitious cross-state trails in the works (the other one is the Ohio-to-Erie Trail, which is a planned 325-mile route from Cincinnati to Columbus and Cleveland. 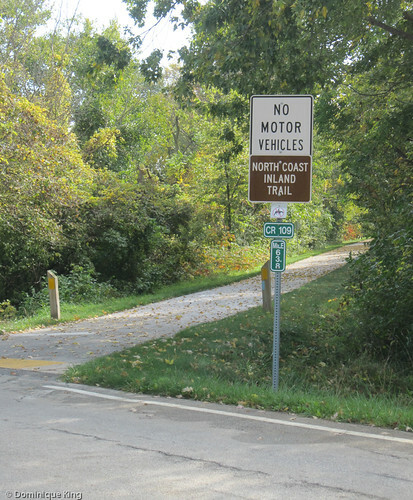 Future plans for the North Coast Inland Trail call for continuing the trail northwest to Millbury, where it will connect with the Wabash Connector and then head west to the Wabash Cannonball Trail in Lucas County. The eventual goal is to have an approximately 270-mile east-west trail span the width of Ohio, connecting it to Pennsylvania and Indiana, with possibly a connector running north into Michigan. 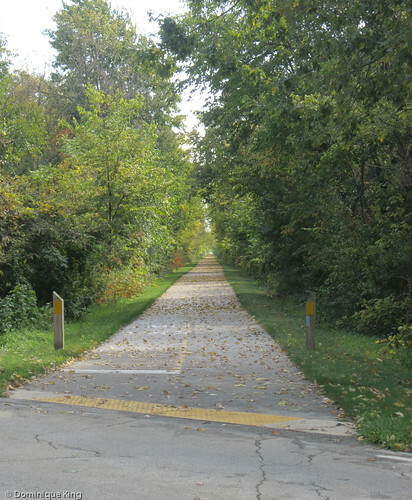 The North Coast Inland Trail would also be part of the larger Buckeye Trail, a more than 1,444-mile network of trails criss-crossing Ohio in a nearly endless loop that began evolving in the late 1950s. Find out more about the North Coast Inland Trail and compare notes with other trail enthusiasts by going to the Friends of the North Coast Inland Trail Facebook page. Want to learn more about Ohio's network of bike trails? Check out Biking Ohio's Rail-Trails: Where to Go, What to Expect, How to Get There by Shawn E. Richardson. My husband and I are thinking of getting folding bikes and carrying them with us on our trips. We run across so many neat trails and so often have wished that we had bikes with us. That certainly sounds like an idea worth exploring, Connie. I had an Aztek for many years and could just stow my bike in the back of it when I had the back seats folded down. No such luck with the Focus I have now. Tim has a bike rack that fits his car at this point, but it's pretty cumbersome to use (either by myself or even with Tim in recent years as he's had some mobility/medical issues). Let me know if you find a good folding bike option as I'd certainly think about that...if only to take to the trails near home.